So many different foods are offered at grocery stores that shoppers are often faced with the challenge of trying to determine which are the most nutritious and healthy. For instance, is iceberg lettuce as good for you as spinach or the more colorful spring mix? Sometimes the options that look the best on the supermarket shelves may not provide the best available nutrition sources that are most beneficial for our bodies and our health. For many people, trying to digest all the scientific research that compares one food to another can not only be very time consuming but can sometimes feel overwhelming. That is why we offer the following suggestions for healthy and tasty substitutions to help you select more nutritious foods—whether you are at home, out grocery shopping, or having dinner in your favorite restaurant. Dark green leafy vegetables—such as romaine, spinach, green or red leaf lettuce, arugula, spring mix, dandelion, and mustard greens—are not only flavorful, but are also a better source of vitamins C, K, and folate, and minerals, like calcium, potassium, and iron, than iceberg lettuce. They also provide more carotenoids and flavonoids, which are plant pigments that can have many health benefits including their ability to act as antioxidants. These darker-colored vegetables may be beneficial for eye health and the cardiovascular and immune system. In addition, they can be preventative of different kinds of cancers, such as stomach, lung, skin, breast, and pancreatic. So, when you have a choice, try to make your salads not only more flavorful, but also more nutritious by including more dark green leafy vegetables. Tip: When in doubt at the grocery store about which ones to choose, simply look for the vegetables in the darkest shade of green. Many vegetable oils sold in stores are often either a single oil or a blend of highly processed oils from safflowers, sunflowers, corn, cottonseed, or soybeans. Each of these is a major source of linoleic acid, an omega-6 fatty acid that may have pro-inflammatory effects when ingested in too large amounts. One of these effects could be a promotion of inflammatory processes in our cardiovascular system. On the other hand, extra virgin olive oil is rich in antioxidants, known as phenols, and in oleic acids, which are a kind of monounsaturated fatty acids. Both components may be beneficial for cardiovascular health and may have anti-inflammatory effects. Furthermore, olive oil may help the prevention of, for instance, breast and colorectal cancer. Plus, a little fat is needed to absorb some of the nutrients you find in produce. Tip: Extra virgin olive oil is a great choice for salads or other cold foods, while refined olive oils, labeled as either light or extra light, have a higher smoke point and therefore are preferable for simmering, frying, or sautéing. Commercial dressings are often laden with preservatives, omega-6-fatty-acid-rich, highly processed vegetable oils, high fructose corn syrup, and artificial colors and flavors. A simple homemade dressing with ingredients such as extra virgin olive oil, avocado, lemon, herbs, and balsamic vinegar can exclude unwanted food additives and excite your taste buds with fresher and healthier flavors. But, most importantly, you will be enhancing your daily diet with foods rich in health-benefiting nutrients and phytochemicals (These are plant compounds, which are not essential or nutrients, but may have beneficial effects on our health, such as anti-inflammatory, anti-bacterial, and cellular repair.). Tip: Try one of our favorite fresh dressing mixes: balsamic vinegar, organic extra virgin olive oil, fresh lemon juice, a little bit of mandarin juice, fresh dill, and some salt and pepper. Whole grain breads, including dark-colored German pumpernickel, have the following health benefits over white bread: 1) a lower glycemic index (GI), 2) more dietary fiber, 3) more vitamins like B1, B2, B6, E, and folate, 4) more minerals, such as iron, selenium, and manganese, 5) more antioxidants, and 6) more phytochemicals. It is important to read the ingredients label to make sure you are buying a truly whole grain bread. For example, the first ingredient listed should be whole kernel rye or whole grains. The dietary fiber found in whole grains helps to make food more filling, plus it may promote better digestive health and reduce the risk of some intestinal cancers, including colon cancer. Furthermore, the intake of whole grains has been linked to possibly improving cardiovascular health and lowering the risk for type 2 diabetes. By simply choosing breads with a lower GI such as sourdough, you will move towards lowering and stabilizing your blood sugar levels, feel fuller longer, find you may be able to manage your weight better, and lower your risk for developing type 2 diabetes and cardiovascular diseases. Tip: Try whole grain bread topped with salmon and avocado spread. We also like to add a little bit of dill, lemon, capers, or horseradish—or all four—on top of the salmon. 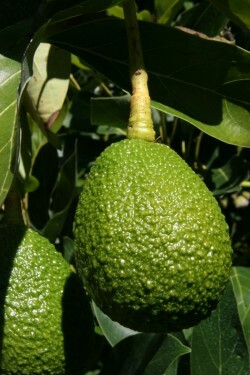 Avocado is not only tasty, but is also rich in vitamins K, C, B6, E, folate, niacin, riboflavin, and pantothenic acid, as well as minerals—potassium, magnesium, and manganese—dietary fiber, and monounsaturated fatty acids (oleic acid). On the other hand, butter is high in cholesterol, saturated fat, and often sodium. Margarine can be made from vegetable oils that are either hydrogenated (which solidifies liquid oils and can result in the development of trans-fatty acids) or mixed with modified palm oil and palm kernel oil, both of which are high in saturated fatty acids. While excessive amounts of saturated fats may raise total cholesterol levels, trans-fats not only can raise triglycerides and the “bad” cholesterol LDL, they also lower the “good” cholesterol HDL. Therefore, since ingesting both can increase the risk for developing cardiovascular diseases, you may want to choose the heart-healthier monounsaturated fatty acids found in avocados. Tip: Other tasty bread-spread options you may enjoy are brushed-on extra virgin olive oil and spreads containing olive oil as well as hummus. We prefer natural, freshly made hummus varieties that are mainly a mix of chickpeas, tahini, herbs and spices, and that do not contain such a high level of vegetable oils and preservatives. Almond butter is a healthier choice than peanut butter, because commercial peanut butters often contain added salt, sugar, and saturated fat, such as palm oil, which is frequently used to improve the creaminess and prevent separation. Additionally, almond butters are available raw, while peanuts have to be roasted prior to processing to prevent their developing problematic molds. You might also like to try products such as macadamia and cashew butter as well as tahini. Tip: Make sure to always check out the ingredient labels to avoid unwanted additives. And in our article “Kick Start Your Day” you can find thoughts on how to make almond butter part of your breakfast. Steaming can make vegetables deliciously crisp and flavorful. And it may help preserve some of their vital nutrients and phytochemicals. Boiling vegetables in water is also a good alternative. As some of the compounds can leach into the water, please use this method preferably for dishes that do not require you to discard the liquids, like stews and soups. The amounts of bioavailable compounds can actually increase when vegetables are cooked. For example, steamed broccoli can be better for you than fresh. Cooked broccoli can have higher concentrations of phytochemicals known as glucosinolates, which may have cancer-protective properties. By using the two cooking methods described above you can also reduce the amount of heated fats in a dish, and avoid the use of omega-6-fatty-acid-rich, highly processed vegetable oils, or butter. 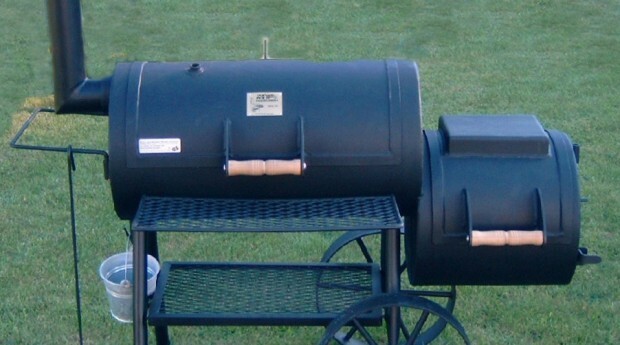 Tip: Try steaming vegetables such as broccoli, leeks, asparagus, and Brussels sprouts. Drizzle a little bit of organic extra virgin olive oil, and then sprinkle some herb salt and maybe a teaspoon or so of sesame seeds or sliced almonds on top for extra flavor and nutritional value. When boiling vegetables in water, please check them frequently to avoid overcooking. Basmati rice cooked al dente has a lower glycemic index (GI) than many other rice varieties. Due to the shorter cooking time, al dente cooking results in rice with a lower amount of predigested starches. It then takes the body’s enzymes longer to digest the rice, and as a result, you achieve more stable blood sugar levels for a long time. By rapidly elevating blood sugar levels, high glycemic foods cause a higher insulin spike than low glycemic foods. Insulin, which is strongly connected to fat metabolism, promotes the synthesis of fatty acids from excess glucose (sugar) in the liver—as well as the storage of these fatty acids in the body’s fat cells—and sends signals to the body to not release any kind of fat. Therefore, frequent consumption of high GI foods that provoke higher insulin releases can contribute to weight gain and obesity. In addition to being associated with a lower risk for type 2 diabetes and cardiovascular diseases, foods with a lower GI may help you feel full longer. Tip: An electric rice cooker may help to achieve perfectly cooked grains. Small varieties of fish, such as sardines, herring, Pink salmon, and Atlantic mackerel (canned), are as rich in omega-3 fatty acids as some larger fish, yet tend to be less contaminated with methylmercury—which is formed from mercury with the help of microorganisms in the water. According to the Environmental Protection Agency, varieties of fish that might contain the highest levels of methylmercury are shark, swordfish, King mackerel, and tilefish. Mercury can be especially harmful for unborn babies or young children and may also harm an adult’s brain, heart, kidneys, lungs, and immune system. 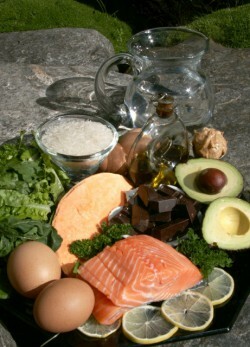 A diet that includes fish rich in essential omega-3 fatty acids—eicosapentaenoic acid (EPA) and docosahexaenoic acid (DHA)—may have potential health benefits such as: 1) positive effects on cardiovascular health, 2) anti-inflammatory properties, 3) supporting the maintenance of cognitive functions during aging, 4) prevention of some cancers, 5) improvement of behavior and learning in children, 6) lessening of depression, and 7) improvement in the skin. Tip: Choose varieties of wild fish and stay away from farmed salmon or tilapia. They have a much less desirable fatty acid profile and lack powerful natural antioxidants like the astaxanthin found in wild salmon. Turkey, chicken, and wild game have lower saturated fat than burgers and popular cuts of beef. When saturated fats add too many calories to a diet, they can contribute to a higher risk for cardiovascular diseases by elevating LDL cholesterol, which in turn raises the total level of cholesterol. High blood levels of LDL cholesterol are a risk factor for atherosclerosis and therefore strokes and heart attacks, because LDL plays a key role in the development of atherosclerotic plaques. Tip: Pan-fry chicken and onions in extra-light olive oil, and then add diced tomatoes and a good organic salsa after browning. If you like spicy foods, try adding a little bit of cayenne pepper for extra zip! 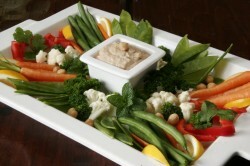 We also like adding steamed vegetables or a fresh salad to this flavorful dish. Unlike commercially raised hens, those raised on farms that operate under organic standards are given “free range,” which means they are not caged indoors, have access to outdoors, and are given organic feed that does not contain antibiotics, commercial fertilizers, pesticides, or additives from genetically modified crops. Sometimes their feed is enriched with ingredients such as organic flaxseeds, which helps to create eggs with higher levels of DHA, a polyunsaturated, omega-3 fatty acid that is essential to our cells, with the highest concentrations found in the brain and eye retina. It may also support the maintenance of cognitive functions as we age. For those of you who may not enjoy eating fish regularly, eggs with higher levels of DHA are a great alternative source of this important fatty acid. Tip: The best places to buy organic eggs are directly from a local family-operated farm, a local farmer’s market, or a grocery food store that supports these vendors. They will be higher in price than factory-farm eggs, but purchasing a better and more humane product clearly offsets the costs. Purified water with or without ice and lemon, diluted fresh-squeezed fruit juices, unsweetened iced teas, and fresh-squeezed vegetable juices are a great alternative to sodas. It is a good idea to dilute the fruit juices at a minimum of 1 to 1 or an even higher ratio in order to cut consumption of the high amounts of sugar in undiluted juices. Choosing the above options can help you avoid the added sugars or artificial sweeteners that carbonated soft drinks contain—as well as their artificial colors and flavors and their sometimes very high caffeine content. Studies suggest that daily consumption of sodas, especially, may put you at a higher risk for overweight, type 2 diabetes, and poor cardiovascular health. Tip: Use a high-quality sparkling water to dilute juices and give your taste buds a soda-like tingle. Adding lemon or a little fresh-squeezed fruit juice for extra flavor in your tea may give you more variety. Tap water that you filtered at home is also a good option and less costly than store-bought bottled water. Soy milk products have no cholesterol and contain much less saturated fat than whole cow’s milk. Additionally, soy milk will even add a little bit of fiber to your diet. Many people struggle with either milk sugar (lactose) intolerance, which can cause bloating, gas and diarrhea, or milk protein allergy, which can affect the skin as well as the digestive, respiratory, and cardiovascular systems. Sometimes, symptoms can be so mild that sufferers are not even aware of the connection. So, the next time you are shopping for milk or cream, be sure to check out the soy selection. Tip: Also available for adults are almond and rice milk beverages. However they have lower protein content than soy milk. 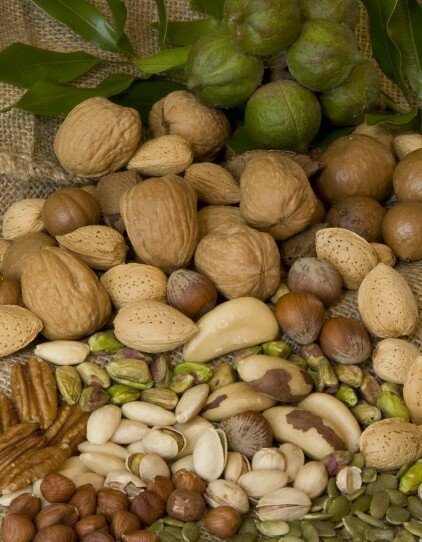 Nuts and seeds contain many nutrients, including folic acid, vitamin E, magnesium, copper, dietary fiber, and protein as well as phytochemicals. 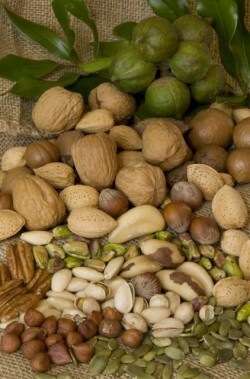 This ‘nutty’ snack can also provide us with heart-healthy mono- and polyunsaturated fatty acids. In contrast, pretzels or chips can be loaded with highly processed flour or vegetable oils as well as sugar and salt. In fact one serving of chips can amount to nearly ten percent of your total daily sodium intake. Too much sodium in the everyday diet has been linked to high blood pressure in sodium-sensitive people. 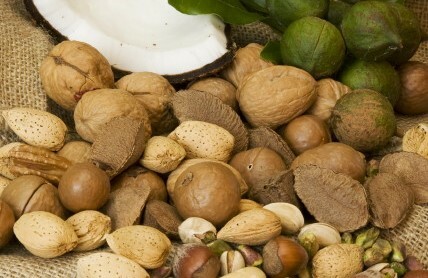 Tip: An afternoon snack of a handful or two of preferably raw, unaltered nuts such as walnuts, almonds, hazelnuts, or pecans will not only be very satisfying but can also help you in a tasty way to meet your body’s need for health-benefiting fats. Dark chocolate, which has 70% or more cacao content, contains less sugar and a higher concentration of flavonoids than milk chocolate. These compounds can be beneficial for cardiovascular health—reducing, for example, the stickiness of platelets, thereby thinning the blood and helping to prevent blood clots. They may even lower blood pressure by increasing nitric oxide—a molecule that has relaxing effects on the cells that line the blood vessels. Also, milk chocolate may contain added vegetable oils. 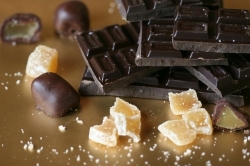 Tip: Try dark chocolate with crystallized ginger. Or, if you need a boost in the afternoon, you may enjoy 1-1½ ounces of dark chocolate with a cup of green tea.